My 3 and 1/2 years old daugther is starting to enjoy complex games. I introduced her to a game that resemble to something physical that she can relate to. Balls are something kids are always fascinated about, and she is no exception, so I thought about pinball. Back in the early 90's, the state of the art was Pinball Dreams for Amiga, for which I have very fond memories. With a little search, I discovered that there's a PC version that's also been declared abandonware and released as freeware. 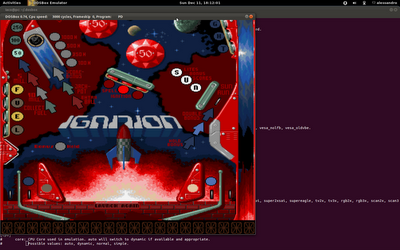 DOSBox runs it fine, but with default settings the pinball table is vertically compressed. that's the trick to restore proper aspect ratio to the table itself.